Dramatic scenery is earnt today as the cretaceous rocks start to appear on what is a strenuous but rewarding day’s rollercoaster walking through the cliffs and coves. After crossing the tiny River Sid on the ornate footbridge you have four energy sapping climbs and descents through valleys that cut through the Jurassic Coastline to contend with. 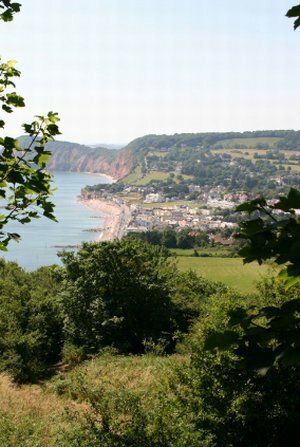 The first, the climb to the top of Sidmouth Gap at Salcombe Hill 500 feet above the waves, is marked with the well named Frog Stone and the Norman Lockyear Observatory. It’s a long descent on steps to the beach at Salcombe Mouth before yet another challenging ascent this time zigzagging above bizarre green tinted cliffs at Dunscombe. All along this section you can still spot small piles of flint waste thought to go back to Neolithic Settlers. Pass through the Wildlife reserve at Weston Mouth and one of those glorious secluded beaches to a run of hairpin descents, remote coves, wild flower meadow and steep cliff climbs including the remains of an iron age hill fort near Littlecombe Hollow in amongst abandoned chalk and lime pits. 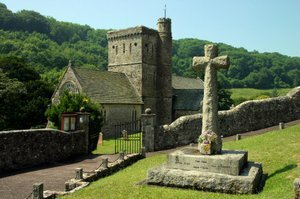 A pleasant distraction on the route today is the tranquil village of Branscombe with its Mill, tea rooms, working smithy and pub set around a huddle of cob and thatch cottages in a beautiful and gentle valley. Don’t miss stunning St Winifred’s Church complete with sections of medieval wall paintings and its three tier pulpit and priests hole. All this a far cry from Branscombe’s most recent history when the MSC Napoli beached below the village in 2007 and spilled its load leading to anarchic scenes with an influx of modern day bounty hunters who made off with everything from BMW motorbikes to container loads of nappies. Looters or Modern Day Wreckers you can decide as you reach the same beach on the Devon Coastal Path. Approaching dramatic Beer Head late in the day a real treat waits, as you enter the rather unearthly and burrowing path that traverses the Hooken Landslip an area where the cliff collapsed back in the 18th Century leaving a chalk undercliff and wide trench. The whole area is now a draw for both fossil hunters and those seeking the rare fauna that abounds in the chalky undercliff. A final climb from the landslip trail brings you to Beer Head and you have now left the red cliffs for white chalk country and rock now from the Cretaceous Period guides you down to the former smuggling haven of Beer. A breathtaking location this place managed to shed its shady past to earn respectability as a centre for lace production a craft, introduced by its Dutch immigrants. Here you will overnight in a narrow cove wedged below the Chalky Heights, a place where the fishing boats are still launched from the pebble beach and you can explore the famous Beer Stone Quarry Caves a subterranean treat, started by the Romans, used by Beer’s more notorious smugglers and well worth a visit before your final days walk to Lyme Regis.